“We keep getting shipments in, and we sell right out,” says Robin Conway, who works in the appliance department of Home Depot. “We got 100 units in this morning, but — let me put it this way — by the time you print this, they’ll be gone,” he tells me. When it comes to A/C, Seattleites have an almost reflexive response — “It only gets really hot for a few days, so why bother?” — which is why we own cooling units at about a third the national rate. But as our heat wave drags on, it seems like a lot of us are reconsidering. Last year, we set a record for the warmest July and August, with an average high temperature of 80 degrees. This year, summer is starting out even hotter. It’s beginning to feel like the new normal. Worse yet, it’s not cooling down at night like it’s supposed to. For the last week in June, low temperatures were at least 10 degrees above average, making it uncomfortable to sleep. In places where this kind of heat is normal, folks are better prepared. Take Washington, D.C., where the average July high temperature is 88 degrees. According to data from the U.S. Housing Survey, more than 9 out of 10 homes there have central air. And nearly any home that doesn’t has at least one window unit. But here in Seattle, only one out of six has central air. About the same number have a window unit — although if the scene at Home Depot is any indication, that statistic is changing as I write this. A lot of folks rushing out to buy window units are probably renters. Only about 7 percent of them have central air, eight times lower than the national average. 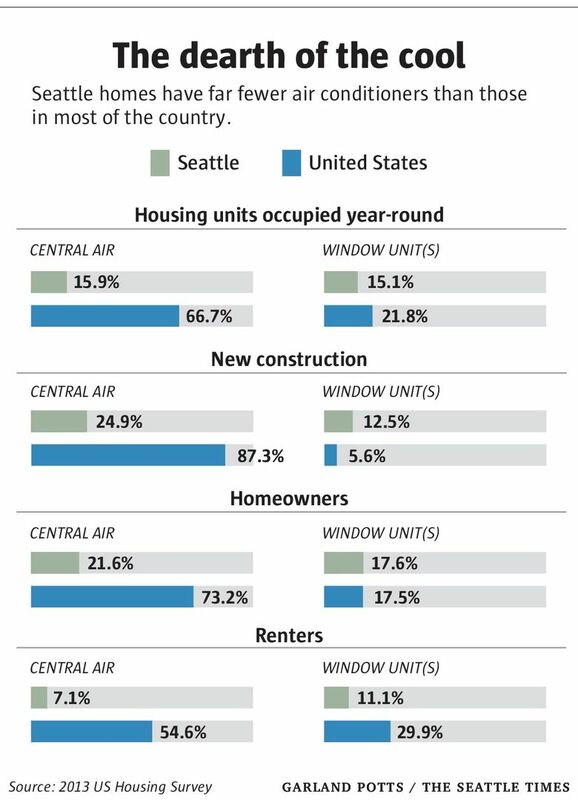 Seattleites may be used to life without air conditioning, but the droves of people moving here from other parts of the country must wonder about the lack. New construction is only accommodating them slightly. Just about one-quarter of homes built since 2010 have central air. Nationally, it’s 87 percent. There’s only one metro area with even less air conditioning than Seattle: San Francisco. But we’re still cooler than they are.